Now where did that ‘information’ come from and what did it mean? Although the same phrase was quoted as far and wide as the Washington Post and the International Business Times, it seems to have come from two NGOs which profess to be neutral but which clearly support ‘rebel’ terrorism against the Syrian Government. These organisations are the Syrian Network for Human Rights and Irin - a corporate subsidised branch of a UN publication. They are 'responsible' for almost all 'fact and opinion' cited by the western mainstream and the UN on Syria. Tim Costello's remarks, arguing against war on the one hand, but demonising an elected government on the other hand, cancel each other out and pose no effective logical obstacle to Australia’s illegal entry into Syrian airspace. They show that the CEO of World Vision has taken sides in a war against a legally elected government which provides with the Syrian national army the only safe haven for 70 to 80 percent of the population against terrorists which ‘our side’ calls ‘rebels’, ‘moderates’ and Da’esh. World Vision should maintain impartiality in all wars because it expects to have access to people in need in territories at war and cannot be trusted if it takes sides. World Vision also solicits donations all over the world on the principle that it is a trustworthy force doing good in conflict zones and refugee camps. It was therefore alarming that Costello spoke against the elected Assad Government, whilst ostensibly talking down war. After this impressive videoed question/statement, the members of the ‘expert’ panel, to a man or woman, including famed 'peace' activist, Joan Baez, completely ignored this Mr Taled's burning question. It was a remarkable televised demonstration of ‘selective perception’; how people simply choose not to see or hear things that contradict a particular bias. However the same panel agreed with lengthy remarks from two members of the audience, who called for the bombing and removal of the Syrian Government. There were several Syrians in the audience who, like Mr Taled, held the opposite view and wanted to express this. We must remember that they had come to that studio in an effort to stop further destruction of their country. Although they had been invited to the studio, they were not given the chance. They were extremely disappointed, with one describing their treatment as ‘appalling’. Although I am used to seeing and hearing constant propaganda about Syria on Australian and US media, I was dumbfounded by the crassness of the propaganda that came out of Tim Costello and other panelists’ mouths because I realised that it would be used to help justify the Australian airforce invasion of Syria on the flimsiest of pretexts and would decrease the ability of the Syrian Army to defend the Syrian people. 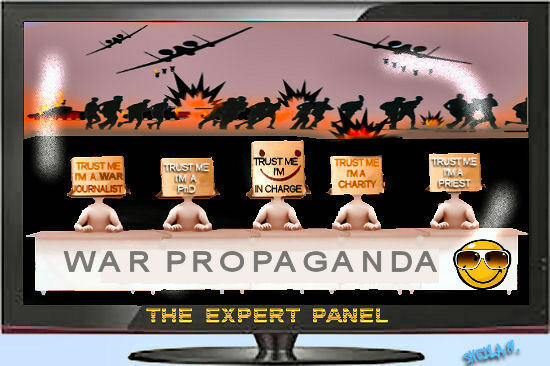 To me there is no excuse for educated people to market propaganda in a war because they have every opportunity to find out the other side. Were none of these irresponsibly arrogant 'experts' capable of looking at RT or Iranian Press TV or the numerous citizen reports on you-tube or studying the many detailed interviews given by President Bashar al-Assad? Were they completely ignorant of the June 2014 elections where he was resoundingly re-elected in elections that were monitored by international observers who reported to the UN? Could they possibly be unaware of the role of our criminal ally, the grotesquely brutal Saudi Arabia dictatorship, in financing the attempted destruction of Syria and the obliteration of Yemen? Each member of the panel came out damning the Syrian government and thereby providing positive propaganda for the Australian Government’s invasion of Syria purportedly in defense of Iraq, but with a stated desire to see the ‘Assad regime’ removed. The consequences of such a role could not just mean many millions more refugees and economic migrants from a devastated territory, but a new world war over this region so bitterly contested by world powers. In the short term it could mean the survival or obscene destruction of one of the oldest civilisations in the world and its people. It therefore seems to me that to repeat allegations that justify illegal invasion or comfort aggression by the questionable painting of a leader of an elected government as evil is a war crime. The Washington Post used the remark in a big article about a battle in Douma, which quotes its source as, "Syrian Network for Human Rights, a monitoring group based in Britain." Note that anyone including many business organisations or governments may become partners and supporters of the United Nations and advertise themselves as such. All kinds of businesses do, including disaster capitalists, awful government departments and propaganda units. The UN has “corporate, government, community and media partners as well as our supporters whose generous support ensures the ongoing success of our many programs and activities.” That is not to say that there are not good things about the UN; just that you need to be sure which bit of the UN you are dealing with who their donors are. The Syrian network for Human Rights and Irin involved in promoting the Syrian Government as worse than ISIS describe themselves as impartial on their websites, but their statements elsewhere show them to be pro-‘rebel’; Prepared to accept US military strikes at any cost, including the destruction of Syria. “But Fadel Abdul Ghani of the Syrian Network for Human Rights told me that he and his group feel that a likely post-attack surge in Syrian refugees and possible deaths resulting from U.S. strikes are still preferable to doing nothing. BOURAN ALMIZIAB: "They are - they are brutal. They are - they are the worst kind of people. We acknowledge that. But before ISIS, tens of thousands of Syrians were killed. Why wasn't there any kind of intervention before? Why is it only ISIS that's the lights are spot on ISIS? We were killed before that. We were killed in tens of thousands, massacres, chemicals, bombs. Everything you call - everything that's in the book, we were there. Tens of thousands of Syrians were killed in jails. They were starved. They were tortured and then they died slowly. Why is it only ISIS being targeted? Why isn't it the Assad regime targeted as well? [...]"